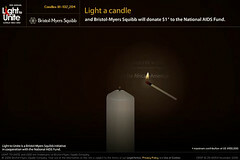 Light to Unite is an annual campaign created by Bristol-Myers Squibb to raise awareness and funds for HIV/AIDS treatment and prevention in the U.S. 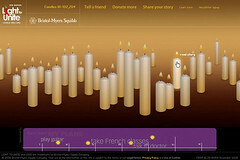 The site raises money by allowing visitors to light a candle. 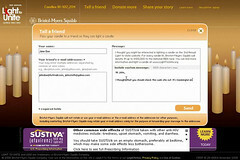 For every person who completed this simple act, BMS donated $1 (up to $100,000) to the National AIDS Fund. The site also allows visitors to read stories about the epidemic, share their own stories and increase the impact of BMS’s contribution by making additional donations to the cause. During the roughly 7-week campaign which started on World AIDS Day, more than 1.8 million candles were lit – which is all the more impressive when you realize that the majority of the site’s traffic came from word-of-mouth and not paid media. This fact was reinforced as soon as visitors logged onto the site. 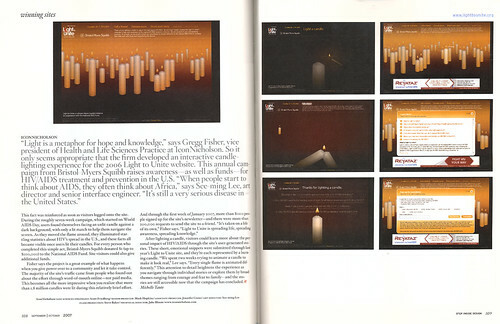 During the roughly seven-week campaign, which started on World AIDS Day, users found themselves facing an unlit candle against a dark background, with only a lit match to help them navigate the screen. 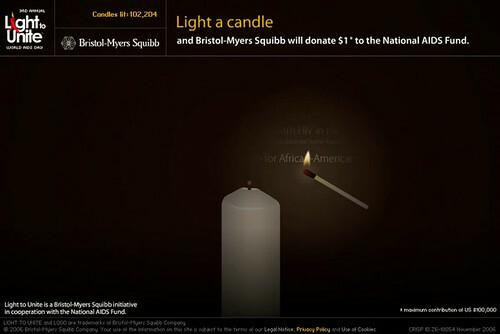 As they moved the flame around, they illuminated startling statistics about HIV’s spread in the U.S., and these facts all became visible once users lit their candles. For every person who completed this simple act, Bristol-Myers Squibb donated $1 (up to $100,000) to the National AIDS Fund. Site visitors could also give additional funds. 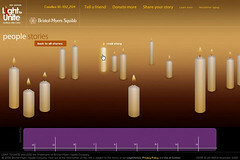 After lighting a candle, visitors could learn more about the personal impact of HIV/AIDS through the site’s user-generated stories. These short, emotional snippets were submitted through last year’s Light to Unite site, and they’re each represented by a burning candle. “We spent two weeks trying to animate a candle to make it look real,” Lee says. “Every single flame is animated differently.” This attention to detail heightens the experience as you navigate through individual stories or explore them by broad themes ranging from courage and fear to family—and the stories are still accessible now that the campaign has concluded.